A tale of life, death, and rebirth is taking center stage in Boston this month. "Ouroboros" is a cycle of three operas with no beginning or end, based on the ancient Greek symbol of a serpent devouring its tail. "Each opera reincarnates one into the other," said Cerise Jacobs, the creator and librettist. Jacobs, a resident of Brookline, Massachusetts, first conceived the idea for an opera cycle in 2005 and in 2010 premiered "Madame White Snake," winning a Pulitzer Prize. "The legend of the white snake, it's a very iconic myth in China. It's about over 1,000 years old, and that one piece morphed into 'Ouroboros Trilogy,'" Jacobs said. "Naga" and "Gilgamesh" later completed the trilogy. "You will see different characters, but you will recognize them from a previous life, so to speak, in a prior opera," said Jacobs. Each opera has a different composer, making this a first-of-its-kind endeavor. "This is the most collaborative project I've ever ever worked on," said Scott Wheeler, composer of "Naga." "Naga" tells the story of a young monk in search of nirvana, who encounters the white snake in his travels. "It's a huge, huge project to be on, and Boston should be amazed and proud that we are seeing this happening," Wheeler said. As "Ouroboros" nears its world premiere, Jacobs hopes audiences will embrace her concept and take time for self-reflection. 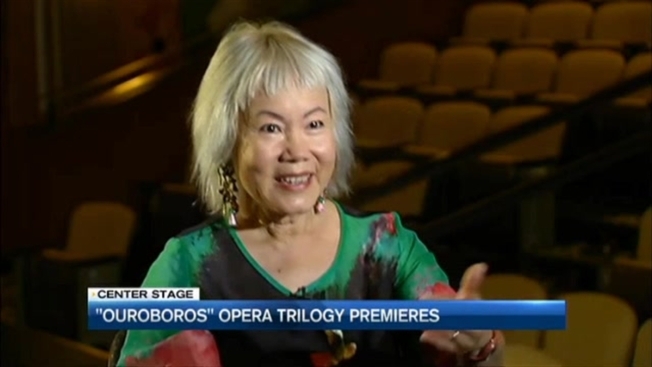 "I just want them to see that new opera is not something that is intimidating but something which can be entertaining and fun, moving and dramatic," Jacobs said. "Ouroboros Trilogy," presented by Arts Emerson, runs September 10-17 at Boston's Cutler Majestic Theatre. You can choose from single tickets or see all three operas in the cycle. Click here for ticket information.